A bumper Easter Monday of football action lies in store today. 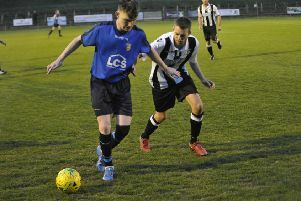 All four of the area’s senior clubs are in action, with Hastings United set for a key relegation six-pointer, and Little Common and Bexhill United facing each other. Hastings are away to Ramsgate in a crunch Ryman Football League Division One South third-bottom versus fourth-bottom clash which could have a significant bearing on which teams end up in the three relegation places. Hastings are a point above their opponents having played an extra game and were 1-0 winners in January’s reverse fixture thanks to a second half penalty from Sam Adams. Both teams will go into the match buoyed by weekend victories. Hastings won 1-0 at home to Herne Bay on Saturday and Ramsgate pulled off a surprise 2-0 success away to fourth-placed Merstham on Good Friday. Kick-off is 3pm. Elsewhere, Little Common and Bexhill will wrap up their campaigns in Macron Store Sussex County Football League Division Two by facing each other at Little Common Recreation Ground. Kick-off is 11am. This will be the fourth meeting between the crosstown rivals this term. Common won twice on home soil in the cups, while Bexhill clinched the reverse league fixture just after Christmas. Common were 2-1 winners at home to Haywards Heath Town on Saturday, while Bexhill were without a fixture. Fourth-placed Bexhill are three places and seven points above Common. Westfield, meanwhile, will bring their Sussex Division Two programme to a close by travelling to third-placed AFC Uckfield Town. That match will also kick-off at 11am. Ryman League, Division 1 South: Ramsgate v Hastings Utd. Macron Store Sussex County League, Division 2 (11): AFC Uckfield Town v Westfield; Little Common v Bexhill Utd. Reserve Section (East): Westfield v Seaford Town 2. Macron East Sussex League, Division 1: Hollington Utd II v Ticehurst. Division 2: Pebsham Sibex v Catsfield. Division 4: Little Common III v Westfield III. Division 5: AFC St Leonards v Grasshoppers Old Boys; Battle Baptists II v Sedlescombe Rangers II 1.30; JC Tackleway II v Hailsham Athletico; Ticehurst II v Mayfield; Wittersham II v Parkfield. Division 6: Battle Baptists III v Punnetts Town II 3.30. Robertsbridge Charity Intermediate Cup quarter-final (2.30): JC Tackleway v Iden (at Iden).